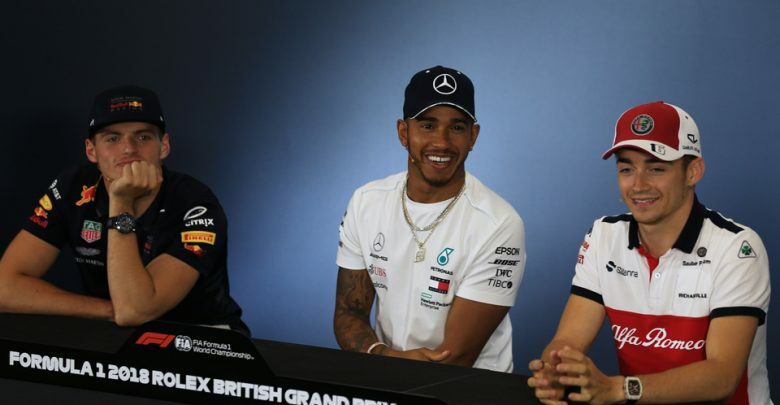 British Grand Prix – Full transcript of today’s drivers’ press conference for the 2018 British Grand Prix. Drivers: Max Verstappen (Red Bull), Lewis Hamilton (Mercedes), Charles Leclerc (Sauber). Q: Charles, what a season it’s turning out to be. You’ve scored in five of the last six races, Q2 in the last six races. Clearly you’ve found a sweet-spot with the car. How much confidence do you have coming into this weekend? 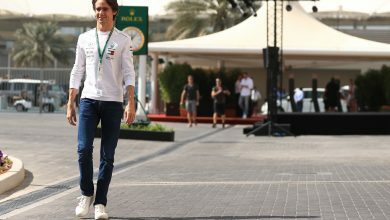 Charles LECLERC: Well, as I’ve said before, the confidence is not so high because I’m always looking at the negatives after each grand prix and yeah, there’s still plenty of negatives. I did some mistakes in Paul Ricard, and again in Austria but yeah, we’ve been in the points consistently, which is great. We definitely did not expect it. Q2, six times in a row now I think, which is, again, quite crazy. I expect a bit more of a difficult weekend here, especially with high speed corners but we’ll try to push and hopefully we’ll have a very positive weekend again. Q: You’ve told us about the negatives but let’s just reflect on the positives of the last few races. You’re clearly getting on very well with the car. Have you surprised yourself at how quickly you’ve got up to speed? CL: To be honest I had very difficult first three weekends this season but then we really did a step in Baku with the approach of the setup especially. I was asking something completely wrong to the engineers in these first three weekends, and then it went a lot better. So, yeah, for now it is going very, very well, and we just need to keep working like that. Q: It’s not easy to be in a team that’s rebuilding, as is the case with Sauber, yet you seem to be dealing with it very well. How much are you enjoying that process and what are you learning? CL: It’s great to see the hard work of the team and that it pays off on the track. It’s not like we’re having a revolutionary change and upgrades – but any time we’ve put something on the car it went in the right direction. And yeah, we’ve seen that on track and it’s not always a given in Formula One. Sometimes you bring something and it’s not doing what it’s supposed to do on track. So, yeah, the team’s doing a great job on that, and they are giving me a car that is easy to drive also. So, everything is going good. Q: Max, a quick moment’s reflection on four days ago, that victory for the team’s home race in Austria and those crazy scenes with those Dutch fans after the race. How do you reflect on it all, four days on? Max VERSTAPPEN: I think it was a little bit of an unexpected victory but, of course, I think they’re very nice to take, especially after Friday and Saturday where we didn’t look fantastic. Then, going into the race, I immediately felt I had a bit better balance in the car, I could at least push it a bit more in the fast corners where we were losing out before. And then yeah, of course, the Mercedes cars in front of me, with Valtteri having a problem, disappearing and then, with the Virtual Safety Car, I think the team did a good job to anticipate that and make the pitstop. And then from there onwards it was all about tyre management and I think we were on top of that. Or course, at the end the Ferrari’s same close but we managed it well, with the whole team and yeah, of course we’re happy to win. Q: One of your best victories? MV: Yeah. I keep saying that. I think they’re all nice if you win. This one was very unexpected and I think that makes it a little bit more special. Q: You’ve had three consecutive podiums now, you’re building some momentum – so where do you feel Red Bull Racing sit in the pecking order among those top teams? MV: Difficult to say. I think it depends on the track. If the straights are pretty long, then we are third. If they’re not too many straights, I think we have the best chassis, so we are very competitive. But yeah, to make a win in Austria is good because normally we’d expect to lose points on the others – and we didn’t, so that’s good. Let’s see what we can do here. Q: Let’s talk a little bit more about that. There are some long straights here at Silverstone but there are some fast corners as well. How do you see it panning out this weekend? MV: I think the problem is that some corners now, they became flat-out and then it basically becomes a double straight, and that’s just very painful. Like Turn One, you’ve got Copse which is flat. It’s a bit of a shame for us. I’m not expecting us to be, like, super-competitive but we’ll there. More or less. So, let’s see what’s going to happen during the race. Q: Lewis, you’re going for record win number six here at Silverstone; your fifth in a row. You know coming into this weekend there’s going to be a huge amount of support in the grandstands for you. Can you give us your thoughts coming into your home grand prix? Lewis HAMILTON: It’s the same as every year really: the British Grand Prix is obviously the most special, in the sense of all the races that we get to do – for me. It’s a real privilege. I was just watching some of the replays of last year, and if you look at the end, and it shows you all of the positions and obviously to see the Union Flag up there is always a great feeling. The fans here are just incredible and the weather is the best it’s ever been. We’re fighting for a World Cup, so I think it’s just a really great time for sport. Q: Why is this race different for you? LH: Just because of the fans. Q: We talked about last weekend with Max, just to reflect on your race in Austria. What follow-ups have there been in the factory? Is there anything you can tell us about why you retired – and are you confident you’re not going to have any problems this weekend? LH: Obviously, we know it was a difficult weekend and of course we have all wished it wasn’t the way it was but what doesn’t kill you only makes you stronger. Honestly, the spirit within the team is stronger than it’s ever been. These experiences we’ve been having and how we’ve been handling them, have really united us more than any other year. There’s a great energy within team. So, while it was a painful experience, it actually brought us closer. I think it made us stronger. I think coming here there’s been some fixes already, immediately after the race, as soon as they got the car back, I think that evening there was a fix that was designed and put into test mode. So, the team was super on it and I’m confident we’ve done everything we can to make sure it doesn’t happen again. Q: (Hans Straus – Media Group Limburg) Max, how do you feel about the triple-header? Is it business as usual or is it extra-difficult for you? MV: It’s a little bit busier but I think as a driver, yeah, we don’t really feel the issues. I think it’s mainly just the mechanics with families and stuff. It’s getting quite busy, for them especially. Q: (Beatrice Zamuner – Motorlat.com) Question to Charles: given the fact Sauber has been on the way up technically and also in terms of competitiveness, would you like to continue being part of this project next year? CL: Well, it’s obviously very interesting to be part of this project, as I was saying. We are growing races after races. They are bringing packages and we keep going more and more to the front, so that’s good to see. Then yeah, we’ll have to see for next year. We’ll have to see what other opportunities I get. And then we’ll see. For now, I’m really focussing on this year. Trying to develop the car, like we did. I think we are… yeah, it’s above expectations, what we are doing for now. As a team I don’t think we thought we would develop as good as we are now. So, that’s great to see, and then we’ll see next year. 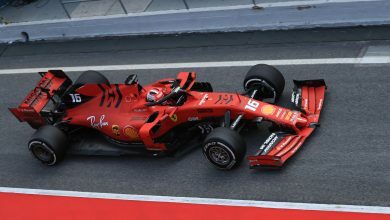 Q: (Livio Oricchio – Globoesporte.com) Lewis, do you believe in this circuit, the new spec of your car, used first time in Austria, can appear more? It’s a more real circuit than in Spielberg? LH: I think the two tracks actually hold some similarities in corner speed and corner pace. Like if you look at the middle and last sector of the last race, as opposed to here. But this is a more demanding circuit, particularly with the temperatures we have here. All the high-speed corners. Copse is most-likely going to be flat; Turn One is going to be flat. It’s going to be one of the hardest races on the tyres, I would imagine. But in terms of car performance, yeah, for sure, we’ll be able to extend… spread the legs of the car more here – but that’s the same for everyone. And high-speed is not really a problem in the cars for us nowadays. We’ve got these big wings, massive tyres, so it should be… it’ll be the fastest we’ve ever driver here so it’s going to be pretty good fun. Q: (Dan Knutson – Auto Action & Speed Sport) Charles, as you say, the team is improving the car, bringing upgrades. How much better are you, compared to the beginning of the season? You yourself, at just getting more speed out of the car? CL: As I said earlier. I think it’s a combination of what I was asking of the car, that was completely wrong in the first three races, and then you are in quite a negative spiral where the car is very difficult to drive, so you try to push more, and you do more errors, and everything is going quite badly. Then, when I understood which balance I wanted in this car, when I arrived in Baku and went with a much more stable balance, especially for the city track, and then we kept that for the rest of the season. And that went in a good direction, also for me, because I could push the limit. It was easier to feel the limit. And then we worked on that and it made a big step for me also because it was just easier to drive. Q: (Andrew Benson – BBC Sport) Lewis, you’ve had an up and down season so far. You’ve had some great weekends and some weekends where you have struggled a bit more. How would you describe the way it’s been for you, yourself, and do you have any indication that it might be like last year, where you developed an incredible momentum in the second half of the season, after you had spent time getting used to everything? LH: I think it’s impossible to say how the rest of the season is going to go. What I can say, as I said just a minute ago, from experiences like we had yesterday, the team are very, very reactive. We’re trying to be proactive, but it’s great to be able to be reactive as well. We have been making a lot of improvements in the car, my feeling for the car, my understanding – that just naturally grows for a driver throughout the year and for a team as you become more aware of the tyres, the strengths and weaknesses of the package you have. I think everyone is going to continue to shift and get a bit better, but ultimately we want to be improving faster than the others if possible. But it has been an up and down season and I can’t really explain it. Part of it is tyres, part of it is that it is a much more competitive year than last year, that we’re fighting two teams. It’s a lot closer, there is a lot more pressure on. It’s how the sport should be, in the sense that you’re squeezing more out of the cars and out of the drivers as well. I think it’s not a bad thing. Q: Lewis, I asked Max to give his thoughts on the pecking order at the front of Formula 1 at the moment, what’s your take on that? LH: The pecking order among teams? LH: I don’t really know. [Max] what did you say? MV: That sometimes I guess we have a good chance and sometimes we’re still third. It depends on the track, for us at least. Who has the fastest car at the moment? LH: Like Max says, it’s up and down from track to track, but I still feel we are the best team, and I truly believe that we will remain that for the rest of the year. Q: (Phil Duncan – PA) Lewis, we’ve seen your Mercedes team make a few strategy mistakes this year. What do you put that down to and do you think it could end up costing you points and ultimately the title? LH: I think if you look at the season, it’s been like that for other teams, I think all teams. If you look at Ferrari, they’ve lost points, I’m pretty sure the Red Bulls have lost points. The amount of pressure, the amount of simulations that go on, the information… there are a lot of tough calls for each team to make. Some of them for sure are easier than others. Maybe the easier one sometimes… it could be one weekend the easier one is the wrong decision and vice versa. That’s just how it is. I hope it’s not a title decider, but, as I said, I can’t predict what’s going to happen going forwards. All I know is that we are constantly getting better and improving. What I can say is that I really do feel like I have the best strategist team behind me. I mean look at how many wins I’ve had within this team. We’ve had far, far more success than we’ve had failures and nobody is perfect. It’s just the way the sport is. There is no way to be perfect. It would probably be boring if that was the case. Q: (Scott Mitchell – Autosport) Lewis, you talked about having fixes in place for the problems last weekend. 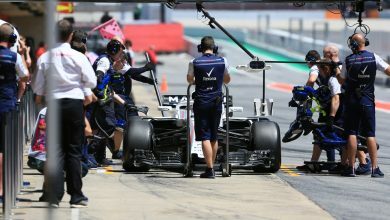 Is there any concern at all that these reliability concerns happened on the second weekend with an upgraded engine, particularly after it had been delayed for reliability reasons in the first place? LH: We’re human, so naturally every single individual in the team will have that a little bit at the back of their mind, that nervousness. But as a driver, as an athlete and as a competitor I personally cannot allow that to interfere with my weekend. You go in with the same mentality as the last weekend – hoping for the car to be reliable. You can never predict what’s going to happen but that’s not getting in my way and I’m pretty certain that for the majority of people in the team they’re not letting that get in their way either. Q: (Giles Richards – The Guardian) Lewis, you’re one point behind Seb in the world championship. Would it be particularly satisfying if you could retake the lead in front of your home crowd? LH: Yes, it would be great. Just taking the lead in general, it doesn’t matter where it is, would be good. I think coming into this weekend there’s obviously talk of historic number of wins and all those kind of things. If I’m honest it’s been a really incredible journey since 2007, coming here and just to be riding this positive wave every time you come to this grand prix. I’m really grateful to be in the position to fight for a win here at Silverstone for the sixth time… not many drivers get to do that. So I’m very privileged in that respect. And the support is unlike anywhere else. No driver… you could say that Max is probably getting close, but we don’t have a Dutch Grand Prix. If we did it might get close. But the atmosphere here is just incredible throughout this weekend, particularly when the weather is good. The hope is always that you can deliver, arrive in good form and perform and that’s what I’m going to try and do. Q: (Rebecca Clancy – The Times) Lewis, it’s only been four days since Austria. The race wasn’t, I think it’s fair to say, wasn’t a great one for Mercedes. Is four days enough? Is the car reliable again? Have the problems been fixed? For yourself, it sounded like on the radio you were becoming increasingly frustrated. Have you moved on and you just reset and you go again for your home race? LH: Yeah, I felt OK after the race. I think you probably could see that after. I think ultimately I look at is as a positive. It reminds me how passionate I am. Everyone in the team felt the same thing. We really do win and lose as a team. As I said, what’s really happened over the last few days, with the team reuniting, and seeing the guys here, just how energized everyone is, we’re like ‘we’re back’. Just that confidence, that will to win is still there. There are fixes for everything and the guys have worked really hard over these past days and what’s mind-blowing for me is how quick people can react and produce things and I’m just excited to get in the car tomorrow. Q: (George Bolton – The Sun) Lewis, you mentioned the World Cup. Are you hoping to give more celebrations to your home nation by having a good weekend too? LH: Yeah, we always come into this grand prix with some kind of epic sport surrounding it, be it Wimbledon or whatever, so… I was actually going to ask what is the penalty for missing he press conference on Saturday? Is it negotiable? I want to be watching the game so… I had to watch on my phone the other day but at least I got to see it. Q: (Alan Baldwin – Reuters) Lewis, there’s been an assumption that you and Valtteri are fighting a Ferrari team whose main focus is Seb. In Austria we saw Kimi finish ahead of Seb, with everyone else lapped. Were you surprised that Seb has in effect missed the chance of getting an extra three points in the battle? I know you gave a place back to Valtteri in the past, but you wouldn’t expect Ferrari to have done that. LH: Am I surprised? There have been scenarios this year, at least one or two, where I though they would have reversed the cars, because that’s the philosophy they’ve had. If I’m really honest I’ve not really put any thought into it. I don’t really care. They do what they do. I literally put all of my focus on what we do and make sure that we remain correct and we deliver 100%. And I truly believe that if we do that we will outperform the others. So that’s what I put my energy towards. Q: (Craig Slater – Sky Sports News) One last one on the World Cup for you, Lewis. Is it coming home, do you think? A big psychological barrier crossed by winning a penalty shoot-out; you know how much psychology plays a part in top level sport? LH: I can only imagine the boys are definitely on a high at the moment, and they just need to continue to try to… I hope they’re sleeping well, I hope they’re eating well because that’s a large part of it and ultimately just going out there and they’ve got to go and enjoy themselves. There’s so much pressure on them, obviously, being that it is the World Cup but there’s so much support for them. England is just known as… they’re such excited fans. There’s so much passion in England for sport, that’s why you’ve experienced it here, you see it at the stadiums, particularly in football and even myself, watching just the other day, I don’t watch enough football. I played it as a kid and I was massively passionate as a kid and I used to collect all the stickers and stamps, magazines, books that they used to do etc and I used to remember playing with Ashley [Young] at school but just watching on the edge of your seat, the passion is crazy for everyone that’s watching their country play. It’s like it’s in your DNA, it’s crazy and it’s so exciting. I’ve booked my day off… is it next Sunday? I think it’s next Sunday. Yeah, I’ve booked that day off, like keep it free because I wanna be in Russia for that day, supporting them. Q: (Livio Oricchio – Globoesporte.com) The subject now is tyres: hard, medium and soft and the new kind of tyre with less rubber. Did the director of your team accept this kind of tyre, suits more Mercedes? In a circle where the track is very hard on the tyre, can you all make a comment on the high temperature they also expect here? CL: I think in Barcelona when we first had them then for the test after the race we tried them and for us it was definitely a good move because we had some problems with the other ones, the normal ones. I believe Pirelli knows what they are doing and if they put these tyres for here, it’s because they believe that it might bring issues with the normal ones. For me, it’s fine for me with these ones. MV: Yeah, I tried both but I didn’t feel a lot of difference. I’m not too bothered. Q: Do you think they suit Mercedes more than anyone else? MV: I don’t know. I think if I drive a Mercedes car I can tell you but I don’t so it’s always a big question mark. We’ll find out. Q: And Lewis, do you feel the car performs better on these tyres than the other ones? LH: I honestly don’t. I don’t really notice the difference, they feel pretty much the exactly same except they are not as easily prone to blistering but we don’t suffer from blistering. I think the last race we had that… if you look at last year, other teams, I think you (MV) had a failure on tyres blistering, right? MV: On a few tracks. LH: I don’t think we had any tyre… we don’t have tyre problems in general. The last race, obviously, I was pushing the tyre way over the limit, trying to recover position and that was just down to me, not down to our car being worse on that tyre or anything like that. Ultimately that’s an excuse that an engineer would look to if you’re not doing well enough, they’ve got to find something to point at and so in my mind they’re just using that as an excuse. Q: (Arjan Schouten – AD Sportswereld) Max and Lewis, just to know your opinion: when you’re 53 points down, halfway through the season, do you still have a chance to win the world title, are you still a serious title contender? LH: If you’re 53 points down? I’ve been 40-something down in the past. I’m pretty sure in Barcelona at one stage I was 40-something down. Did I come back that year, was it that year that I came back? It is possible, it can swing around. MV: We don’t have the package to fight on every track. For example in Monza it’s just going to be difficult so it depends in what position you are. If it’s compared to your teammate then I think you still have a chance to come back but I don’t think we are in a position to do that. For sure, there are some tracks where we will be really competitive and we can definitely challenge for victory but not on every single track so to come back like that, you need to be winning almost every weekend. 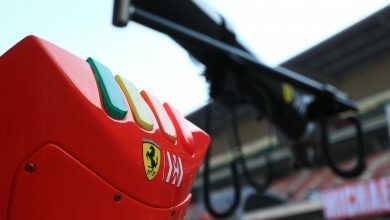 Q: (Scott Mitchell – Autosport) You’ve got the opportunity this weekend to have the DRS open through turn one. What are your thoughts on that and do you think it’s going to be possible in qualifying? LH: I doubt it but probably everyone will try. Max will be the first to try, I’m sure! We’ll all follow Max and see what happens with him! But it’s usually quite bumpy into turn one. I think it’s highly unlikely. But it’s going to be even quicker anyway so these tyres… you just slide… it’s quite a quick corner and a lot of pressure and a lot of energy goes into the tyres so I don’t even know if it’s going to be better anyways but we will find out. Q: So Max, flat through turn one, DRS open? MV: I think not every team. I will definitely try it but we’ll find out. I don’t think you will gain massively after that corner and like Lewis said, probably you will use the rear tyres a bit more as well but we will find out, I think. And also it depends a bit on what kind of wing level you are using. CL: From what I’ve heard, it was already quite difficult last year without DRS so yeah, we will try to make it flat out first and then we will see but I don’t think it will be flat out with DRS. LH: Actually I have a question for you guys. How am I doing? I notice I’ve got two 20-year olds next to me. The oldest driver here by a long way. I’m nearly one of the older drivers here. MV: I think it’s alright. You’re doing fine. LH: Thanks, man. Appreciate it! Q: (Andrea Cremonesi – La Gazzetta dello Sport) A question for Max and one for Charles. For Max, I would like to ask you if now you are sometimes fighting for victory, I would like to know if with the performance all is showing now, if you are confident for next season to fight for the victories, or do you believe that next year you have to have a harder life? MV: It’s difficult to say at the moment. It’s quite a long way away and they are in a good way, they are progressing. I’m honestly not thinking about that yet. Of course, it gives a lot of motivation for the team for next year but we have to wait and see how it’s going to be until pre-season testing. Q: Did the team consult you prior to making the decision to go with Honda? MV: It’s something for my career as well, the steps, so we definitely talked about it but at the end of the day I’m not deciding that. I think it’s a positive move. Q: (Andrea Cremonesi – La Gazzetta dello Sport) And for Charles, if you aware that this is the track where Alfa Romeo won the first ever Grand Prix, so what does it mean for a guy like you, that you have the brand of Alfa Romeo on your overalls? Q: Charles, Alfa Romeo won the first Grand Prix here at Silverstone, May 13, 1950. Are you a man who appreciates the history of the sport? How does that make you feel given your association with Alfa? CL: Yeah, definitely. I learned this news from the team this morning, I didn’t know it from myself only but it’s a special Grand Prix for the team, then on the other hand we are not in a space at the moment to fight for the win yet but yeah, I hope to bring a very good result to the team, hopefully again in the points. But we will not bring a win this weekend. Q: (Phil Duncan – PA) Lewis, we’ve seen you crowd surf after your victories over the last couple of years. Have you got anything up your sleeve this year which may triumph that or go even better? LH: Honestly, those are all kind of spur of the moment things. I definitely think if…for anybody to pre-plan something, you’re allowing karma to… not karma but negative things to potentially happen. It’s like if England starts celebrating before they get to the actual game it’s probably not a good idea. No, those experiences were just incredible and I was just watching some footage of the experience in the past. I think the best picture I’ve ever seen was when Kimi and I think… was it Kimi? A couple of drivers were sitting here and I was outside. I need to re-post that, because that was pretty cool. Just engaging with the fans here is just electric. So I hope to get to do that all weekend and naturally you want to make everyone proud, you want to complete the weekend. They’re going to have a great weekend regardless. It will be the cherry on the top of the cake if you’re able to pull something special out of the bag. Q: Lewis, how much do you feel your support here at Silverstone has grown since 2007 or has it been huge since the outset? LH: No, I think it’s continued to grow. I think it’s… and as years go on, you appreciate it more and more but 2007 was already pretty cool, I think from that qualifying lap. And then 2008 was just… I really will never forget that day. And then it’s just been growing ever since really. I hope that continues. Who’s the next Brit that’s coming? After me? I won’t be here for ever. LH: Yeah, well. I hope I can wave the flag for a little bit longer.